In the 16th century protestantism, especially Calvinism, grew in popularity in the Low Countries. But since the Calvinist faith was outlawed and actively persecuted by the Spanish rulers, there were no protestant churches, and clandestine services were held in the open air. The rebellion against the Spanish king, which started in 1568, gave way to more religious freedom for protestants. Unlike what is often told, the rebellion was not a war for religious tolerance. Everywhere the rebels seized power the catholics, who usually were in the majority, lost their religious rights, except for some parts of the current province of Limburg, where catholics simply were forced to share their churches with the protestants. In all other cases, churches were handed over to the calvinists, who soon became a privileged minority. Other protestant groups were tolerated, but prohibited to build churches that were recognizable as such. Later this prohibition was changed, and non-calvinistic protestant were allowed to build recognizable churches on the condition that these did not have towers. Catholics continued to depend on churches that were not instantly recognizable as churches, but instead looked like houses, barns etc.. In 1795 the occupation by French troops made an end to the privileged position of the calvinists. Although in large parts of the country, for as far under Republican control, many former catholic churches could be used for protestant services, in some cases the construction of an entirely new church was necessary. This was especially true in those provinces where a large number of protestant refugees from the southern Netherlands had drastically increased the population. 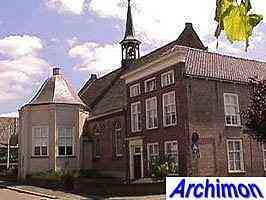 The first protestant church in the Netherlands was however built in a new fortified town, Willemstad in the current province of Noord-Brabant. This church was constructed from 1597 to 1607, and is especially noteworthy for its ground-plan; the church consists of an octagonal main space, and an (unfinished) tower. Centralization in church architecture soon became the protestant ideal. In churches like these everyone could have a good view at the minister and hear what he had to say. Usually though, fairly traditional churches were built, like this small church in the former village of Besoyen, Holland, which today is a part of Waalwijk in Noord-Brabant. This example dates from 1610, but similar traditional churches continued to be build until well into the 18th century. 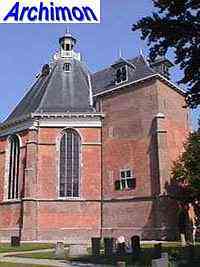 A protestant church in pure Gothic style was built in Harkstede (Gr) as late as 1692! In most cases these traditional churches were built for small protestant communities, where there was no need for a complicated centralized church because everyone could hear and see the minister anyway. In a fast growing city like Amsterdam, the former catholic churches and traditionally built new ones were just not sufficient. With the city being cramped with countless protestant refugees and merchants (who at one time even formed a majority of the population), a few new churches were built in Mannerist style, a regional variant of Renaissance architecture. Hendrick de Keyser built two similar churches in this style in Amsterdam, the Zuiderkerk (built 1603-1611), and the Westerkerk (1620-1631), which for some time was the largest church specifically built for protestant use in the world. 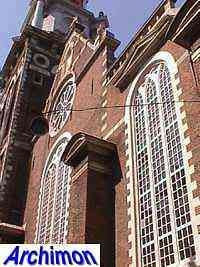 A third church by De Keyser in Amsterdam was a centralized church, the Noorderkerk. Centralized churches were mostly built in larger towns, although there are some in smaller places as well. A few of these churches were built in the Mannerist style. 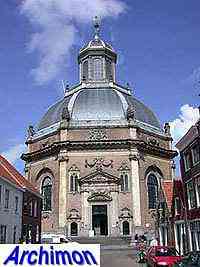 But especially in the provinces of Holland and Zeeland similar churches were built in a style strongly influenced by Classicism. 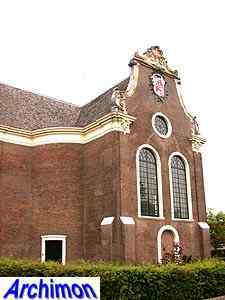 A classic example is the Oostkerk in Middelburg (Z), which was designed by Arend van 's-Gravesande and built from 1647 to 1667. This is an octagonal building with a dome and a finely decorated entrance. 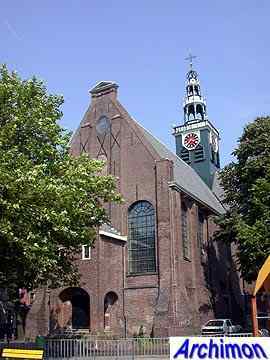 Another important centralizing church is the Nieuwe Kerk in Den Haag (ZH), built in 1649-1656. But unlike the more usual circular or octagonal ground-plans architect Pieter Noorwits for this church opted for two octagonal spaces connected by a slightly narrower rectangular space where the pulpit was positioned, thus still complying to the protestant ideal of a centralized church. Inside there are no pillars that could possibly block the view. 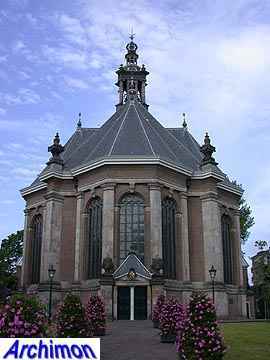 The Grote Kerk of Westzaan was built in 1740-1741 and is the only church in the country in Louis XV-style.